For other games in the basketball genre, see Category:Basketball. 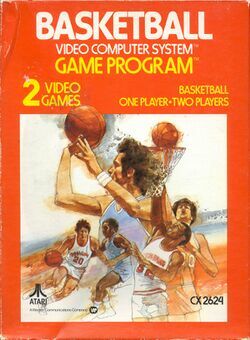 For the Intellivision game, see NBA Basketball. 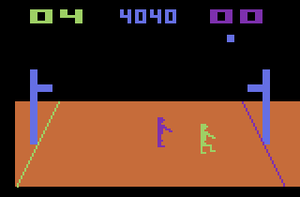 Basketball was one of the eleven Atari 2600 titles that were part of the second wave of games released in 1978. It was designed by Alan Miller, who became quite renowned for his ability to make accurate sports conversions that pushed the graphical limitations of a system by utilizing a three-dimensional perspective. 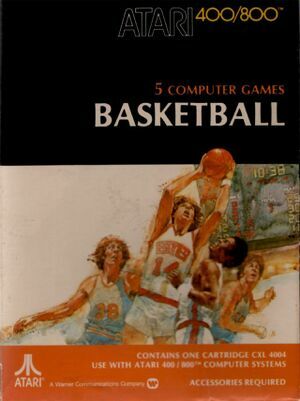 After completing work on the Operating System for the Atari 400 and 800, and just before he left Atari to co-found Activision, he made a similar conversion of Basketball for the home computers, which was the first game to be published for the systems, in 1979. In May 1979, Chris Downend designed an arcade game of Basketball based on Alan Millers original design. It is commonly referred to as Atari Basketball, as another Basketball arcade game precedes it (developed by Taito Corporation in 1974, composed of dedicated circuits as opposed to a processor.) Rather than utilizing joysticks like the original home versions did, the arcade game was designed to be played with a Trackball, perhaps in an effort to capitalize on the popularity of the same controls found on the Atari Football arcade game. 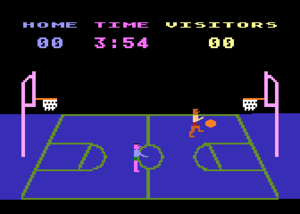 In an unusual fashion for Atari 2600 games at the time, Basketball only features two game variations; a single player game and a two player game. An offensive player will always face the basket while a defensive player changes directions to face the ball. The players are directed around the court by using the joystick. They can be directed anywhere onscreen except beyond the "endline" when on offense. To shoot the ball, the player must press and hold the fire button. The on-screen player will then begin to raise the ball over his head. The higher the ball is, the higher the ball will be thrown. The lower the ball, the lower the shot that will be taken. Once the ball is thrown, the player on defense must press the button to jump in the air in an effort to block the shot and steal the ball away. Defensive players can steal the ball by rushing the offensive player at just the right height so that the ball leaves one players hands and is held by the other. Each game lasts for 4 minutes, and will begin with a jump ball. After a ball is successfully thrown through the hoop, the defensive player resets to directly beneath the basket an the offensive player is reset to the center of the court. Each players' handicap can be set by using the difficulty switches. When set to "a", the players move slower towards the hoop. Thus a beginner player can still catch up with an expert player by leaving their difficulty switch on "b". 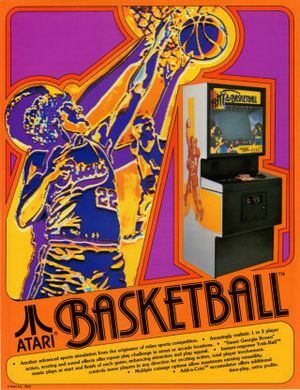 The Atari home computer version of Basketball is virtually identical to the Atari 2600 version with a few subtle differences. First, it obviously has a superior look to it, as the players, the ball, and the baskets are more clearly defined. Secondly, the number of players has been increased to four in the case of the Atari 800, which contained four controller ports. As result, the number of game variations has been increased from 2 to 5. Game 1 features a one-on-one match against the computer. Game 2 features two players together on a team against two computer controlled opponents. Game 3 features two players on one team versus a team composed of a third human opponent along with a computer controlled opponent. Game 4 features a full two-on-two match with four human controlled players. Game 5 is a one-on-one match against two human players. Note that in order to control the players in Game 5, the left hand player must be plugged into controller port 2, and the right hand player must be plugged into controller port 3. As a result, it is difficult, if not impossible to play this version of the game on any Atari home computer other than the Atari 800, since no other models contained more than two controller ports. Since the arcade version of the game is modeled after the existing home versions, the gameplay is extremely similar to the previous two versions, as far as a one-on-one game is concerned. The only difference here (besides the use of a black and white display,) is the use of Trackballs instead of joysticks. 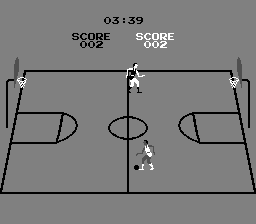 The player moves their on-screen counterpart across the court by rolling the Trackball in the desired direction. Everything else about the controls, including the procedure of holding the button down to shoot the ball, remains identical to the home versions. This page was last edited on 7 January 2015, at 01:00.